Everything is much simpler when it’s black and white. If the world was black and white, life would be easier. The world has 32 million different colors, and your Dual G4 has just as many, which makes it just as confusing. How can you tell the difference between yellow #125325 and yellow #125326? Black and white is the ultimate contrast, and thus the easiest to understand. Hard drives are overrated. They are heavy, magnetic, and burn out easily. The floppy drives on a Mac Plus allow you to run the operating system on one disk your programs on the other! Floppy disks are not indestructible, but they cost a whole lot less to replace than a hard drive. If one disk or drive goes bad, the others are not affected. When a hard drive goes bad you could lose everything. These days you can even find free floppy disks at garage sales or in people’s trash (remember to ask permission). System 6 is blazingly fast. Because that annoying multiprocessing “feature” is not present in System 6, programs open instantly – and there are no programs in the background to crash the program you’re using in the foreground. You run what you want to use, and there is nothing else to get in the way. Sound is as good as it has always been. You say your G4 has stereo 16-bit 44.1 KHz sound? Count the speakers on your G4. Yeah, that’s right – one. How many on the Mac Plus? One. Nothing has really changed, unless Apple has somehow managed to get stereo sound to come out of a single speaker. Portability. The Dual G4 tower has handles, but the computer alone weighs 30 pounds. If you have a monitor, you could be looking at another 50 pounds. The Mac Plus has a handle and only weighs 16.5 pounds including the monitor. You could probably even sell your laptop, if you own one, because the Plus weighs so little. Less connectively can be good. If you have broadband, then you may be connected to the Internet at all times. Who knows what information is coming in and out of your Mac! With a Mac Plus you know the answer: None. It is never connected to the Internet, and you really never need to be. The Web is useless with a black and white screen (except for a few sites like Luddite Mac). Email is 90% spam. Having a Mac Plus means having the maximum security possible against Internet hackers and the least amount of spam. Compatibility. 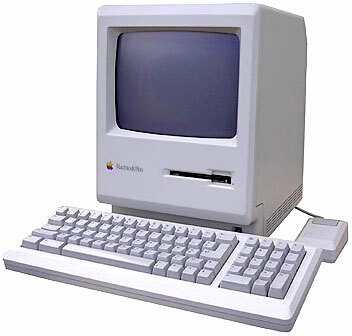 The Mac Plus is one of the few computers from Apple that supports from System 1.1 through 7.5.5. The great thing is if you ever need system 1.1 through system 7.1, you can boot from a floppy with that system on it. No more mucking about with hard drive partitions, Apple Startup Disk, and reinstallation. Cool as room temperature. The Dual G4 has a huge heat sink, multiple fans, is noisy, blows enough heat to be considered a space heater, and is 3.4 inches taller then the Mac Plus. The Mac Plus, on the other hand, has no fans, no heat sink, is quiet, and lets off very little heat. Easy to fix. You may be able to open your G4 like a microwave oven, but if something breaks you may be looking at a huge amount of money to repair it. Your vacation money could be drained by a millisecond of static electricity. The Mac Plus is extremely hard to open, but if it breaks you can purchase replacement for about $30 bucks fully loaded. That’s half the cost of the cheapest repair shop’s hourly rate. And since all your data is on floppies, you never need to worry about transferring data to the new computer. There you have it. Ten reasons to go back to the Mac Plus from your Dual G4 Tower.